Over 1000 knitters have gone from being #SockVirgins to #SockStars to #SockWhisperers using #SockVirgin and #SockStar tutorial patterns. 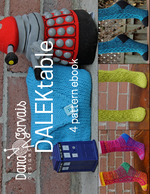 A 4 pattern ebook featuring 4 Doctor Who inspired patterns. 3 socks and 1 bag (the bag really is bigger on the inside). Wrapping myself in cozy, warm stitches on a chilly day is one of the most comforting feelings in the world and actually makes me look forward to the chilly mornings of fall and the frosty days of winter. The Caffeine Collection is a collection of 4 addictive accessory patterns for caffeinated (or decaffeinated) knitters! The collection includes Caffeine socks, Caffeine Hat, Caffeine Fingerless Mitts and Caffeine Cowl. All patterns are worked in DK weight yarn and all patterns are graded for multiple sizes. Matching accessories have become kind a big thing for me. When I’m wrapped in the warmth of a comfy hand knit hat, a cozy hand knit cowl, and toasty hand knit mitts, I like them to match, or complement each other, either by sharing the same stitch pattern or being worked in the same yarn. When my knitted accessories complement each other, either by colour, or stitch pattern, it allows each piece to stand out without competing with the other accessories that I’m wearing. Matching accessories make me look more polished and put together, even on days when I might not feel very polished or put together. So, I’m on a mission to create sets of matching knitwear accessories in my favourite colours using my favourite yarns and stitch patterns. Create Your Own eBook! Put Any 4 Patterns In Your Cart & Only Pay For 3!! Create Your Own eBook! Put Any 4 Patterns In Your Cart & Only Pay For 3! Create Your Own eBook! Put Any 4 Patterns In Your Cart And Only Pay For 3!! Create your own ebook! Put any 4 patterns in your cart and only pay for 3 - no coupon code required! Create your own ebook! Place any 4 patterns in your cart and only pay for 3! This sock was designed late in the year while I was reflecting, soul searching and contemplating on the feelings and experiences I want to manifest in the new year that was about to start. Create Your Own eBook! Put 4 Patterns In Your Cart & Only Pay For 3!! A simple mindless knit for the intermediate sock knitter and a great starter pattern for the first time sock knitter, “Om…” is a canvas to showcase the amazing colour, depth and beauty of artisanal yarns like those dyed by hand at Mythic Yarn. A cute, quick, stashbusting knit makes a great gift or a nice knit for yourself. Paired with a cute notebook and tied with a ribbon this makes a charming hostess or teacher gift.